As soon as I had finished interviewing Christine Barrett, I pulled up the YouTube video of Taylor Swift singing Shake It Off. “I think there are still a lot of people afraid of failing ­– a lot of that is about fear of not being successful.” “We need to embrace failure. In Microsoft we say, when you fail, fail fast, learn and move on. “The true learnings are when you have failed, either in your personal or in your work life, so learn from you failure, and look at what you might do differently next time,” said the Kildare native. 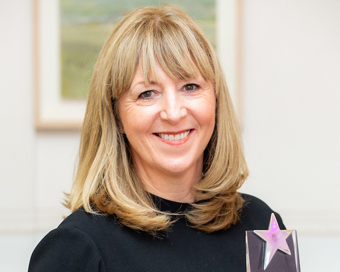 Although she oversees digital sales for the UK, Christine is based in Microsoft’s Dublin office – operating out of the capital, but also using resources based in the UK. She’s been with Microsoft for about 20 years, 15 of which were spent in the company’s Operations department, three as head of Customer Support for Microsoft EMEA, and the final two in the Digital Sales. But she didn’t start out in life as a techie. After studying French, German and international marketing at DCU, she spent several years working in Paris and Germany in sales and marketing before returning to Ireland in 1997 and taking up her first job with the IT Multinational. Another thing that motivates Christine is diversity of inclusion, something very close to the heart of the Microsoft ethos. “The company is very focused on diversity of inclusion across all departments – whether it’s gender, sexual orientation, cultural or generational diversity, for example.” Equality is important to Christine, who revealed that some of her experiences as a young businesswoman highlighted the necessity of a level playing pitch for all: “Early on in my career, when I was working abroad, I came up against significant chauvinism. “Having had experience of this myself has made me very aware of the need for gender and cultural diversity and inclusion of all kinds in the workforce. Christine’s team is evenly split between male and female, she revealed – in what is a very conscious move to reflect the firm’s customer base: “This was a very deliberate initiative; it’s not something that just happened,” she explained, adding that, in terms of diversity and inclusion, another very positive Microsoft adage is ‘Come As You Are, and Do What You Love’. Yes, she admitted, there is opposition to the idea of quotas, but she believes they’re needed: “If you look at the last 100 years or so, we haven’t made huge progress. “If you don’t measure it you don’t see progress, so I’m all for quotas. You have to be deliberate and think beyond comments like ‘the token female’ – you have to look at it as a measurement or quota of how you are doing in terms of gender diversity. Christine regularly relates a powerful anecdote about a successful woman many years ago whose response to being asked about her personal ‘Secret sauce,’ was simple. “It was 10 two-letter word,” recalls Christine: If It Is To Be, It Is Up To Me.